I offer my curriculum free to you in hopes that we can bring authentic learning and fun back to the classroom. The lessons are organized into 9 units on the following 9 pages, beginning with Monitor Meaning and ending with Synthesize. The lessons are written in an inquiry format, so students will engage, then explore, explain to you, test on whether they understand, and then reflect on their learning. Try them out like training wheels. I hope you will be inspired to write and share your own. In addition, I’ve posted lessons for most of the challenges I confronted like teaching students to talk to one another. They are on the pages following the strategies. Everything is hyperlinked so if you run into an idea on one page and the explanation is not there, click on the highlighted word and it will take you to a more specific description. You can also search the site using the search box in the upper right corner. A sample timeline I follow for my units is posted on the timeline page. I suggest you make a similar matrix using your state standards. It will keep you from hyperventilating over all you want to do. You definitely need a gathering spot for the whole class. If your room is small, teach students how to move their chairs to make a circle around the desks. With older students who hate to sit on the floor, map out a way for them to quickly move their chairs to a space in the room. I still think you need to scrunch up together into a more intimate setting for starting and ending your lessons. You need some system that allows students to save their first thoughts. A composition notebook is perfect. Students collect first drafts of reflections, practice, reading and writing work, even math – depending on how daring you want to be at the start. Whatever you decide, students should see that today’s work builds on yesterday’s and tomorrow’s builds on today’s. Papers should no longer be loose on the floor. Each student will need between 1 and 4 notebooks for a year depending on how much each writes. For help, read my website pages on daybooks, Thinking Out Loud On Paper, or Aimee’s Buckner’s books on reading and writing notebooks. There are also books that will help you with notebooks for any content you teach. You may also have a binder or computer system that works for you. Don’t feel like you have to change. You need a way to keep track of your anecdotal notes. You will be meeting with students and you need to remember what happened in those get-togethers. Someone at your school has a recording method figured out. Ask them and then make the collection system your own. 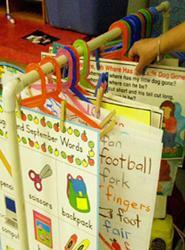 You also need lots of chart paper and markers or a system where students can retrieve the work the class composed. Some teachers type the anchor charts when they retire them from the wall. Then, they keep them in 3-ring notebooks that are available to students. Others make a rack like the one in the photo so no typing is necessary. You will also like to have a show portfolio for finished work. You may have worked with your school system to create one. Binders, computers, or boxes work well. Google “school portfolios” to find samples for your grade level. CLICK to see an example. Just don’t let the lack of any material stop you. Jump in and invent along with your students as you go. Expect to be satisfied in 2-3 years, ecstatic in 5. 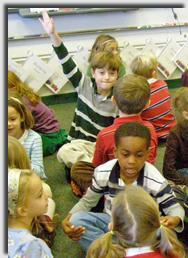 Choice Literacy – Debbie Miller, Aimee Buckner along with 2-dozen others have pages on this site. Videos, lesson ideas, etc. What do you need? They have it.